Everyone is trying to pinch pennies. But I wouldn’t be doing my job if I didn’t send up a warning to be extra careful if something is “free.” A “free” something will almost always lead to strings attached or something expensive coming later, like a repair, further services of some sort, or worst … it could be a scam. 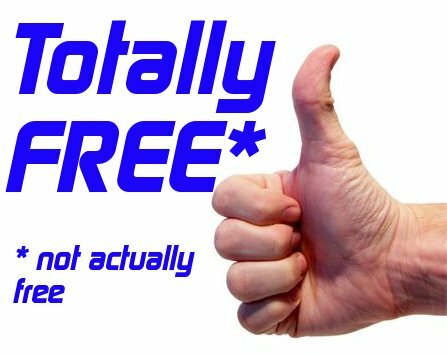 In the professional world, “free” is used to attract you and extract your personal information so they can use it to get money out of you for something else. Here in the 21st century, your information can also be used against you in the cyber world. It is equally important to realize that paying for a valued service versus a free service does have its differences. A free service (such as an estimate, consultation, product, etc.) will only provide you with a fraction of the information, leaving you hanging for more, but then you will have to pay for it, often in more ways than one. A paid service will get the job done to completion the first time, if you choose the right professional. Everyone is always attracted to “free” but should we be? My late father had a saying, “If it’s free, take two.” He was a Depression baby. I am not. This is the thought process of many people. But no, I will not take “two” because I don’t want to clutter up my home with things my child won’t want one day, and I don’t want right now. I won’t do that to my family. What possible trouble could “free” cause? What if the service or information is inaccurate? Where does the liability lie? What if you get hurt, someone else gets hurt, or property (such as your home) gets damaged? What if they don’t complete the job, or the job goes for months with no accountability? What if you dislike the results or get really bad information? What if you hired family, friends, or neighbors? That relationship will never be the same. And finally, what is your recourse if no money changed hands? Many times, people have ulterior motives for offering something for free. Not always, but a good bit of the time, it’s true, even in my own industry (as well as every other industry). “Free” is never free. It just sounds good. Free can mean hasty mistakes, and free can mean costly mistakes. Sometimes free can be very expensive. The voice on the phone was very shaky and distressed. Through her tears, I heard her say, “Doing business with people in your industry is like doing business with cockroaches.” A knife to my gut would have hurt less. Those words were truly cutting and very upsetting to those of us in the industry who put our hearts and souls into assisting our clients. This woman called my office to complain about an estate sale company, one which was completely unfamiliar. I own and direct The American Society of Estate Liquidators® and complaints regarding our members, who uphold a Code of Ethics, are minimal. When a complaint is made on our members, usually it is easily remedied, like replacing a widget that was accidentally sold. Phone calls like this woman’s are starting to come in at an alarming rate, and the complaints are serious. So serious, some of them are criminal in nature, and law enforcement and the court system become involved. For someone like me who has done my best to pave the way for ethics, integrity, and high standards in the estate sale business, this is a massive black eye. It hurts personally. Some of the customer complaints include not getting paid after a sale is completed. Liquidator complaints include clients who pull items from a sale, during the sale, when they see how low the prices are and don’t want to pay the liquidator’s imposed fees. I could never defend estate sale professionals who run an unethical business and cause these people to fall to pieces emotionally. This is not why the “good ones” went into the business. We went into business to make a positive difference in the lives of our clients. We strive to uplift them and their emotional turmoil. However, I will defend the good estate sale professionals who work from a thorough contract, have explained everything to the client with the client’s agreement, and simply do their best to get the highest proceeds from the sale. The estate sale professional has the right to earn a good living; the work is back-breaking, disassembling a lifetime of accumulation in just a few short days. In some cases, the clients expect far too much. They have not yet awakened to the fact that our economy is weak, despite what the news is promising. The estate sale professional has the right to charge a fees or commission for items clients give away, take or remove from the sale, even though the clients have signed a contract that they will not do so. This is taking income from the professional. This leaves them with egg on their face when the public arrives and screams at them because advertised items are gone. This is simply not fair. When searching for an estate sale professional, or any professional service, the responsibility falls on the consumer to research them thoroughly and interview several. When I close my eyes and remember the times with Mr. Lee and Mr. McGee, it doesn’t seem so long ago. In reality, it was over half a lifetime ago when these two older gentlemen helped sculpt me into The Estate Lady® I would eventually become. Way back in my mid-20s, I discovered quite by accident that I had a knack for buying and selling antiques. While it was a risk at such a young age, newly out of college and on a strict budget, I decided to commit to renting a booth in an upscale antique mall for six months. It just so happened it was their upscale antique mall. As each week passed, I noticed more and more of the items I was selling were gone from the glass case, so naturally I was thrilled they were selling. Little did I know that two of the owners of this vast and expensive mall were watching me. One day, as I finished putting more new items into my glass case, Mr. Lee and Mr. McGee approached me and asked if we could talk. As an extrovert, I rarely meet a stranger, yet I was intimidated by these two who had accomplished so much in life. Both had been in the business over 40 years. Both were successful; both knew so much. Here I was, knowing very little, being steered by gut instinct only, and feeling like a little mouse wondering what they could possibly want from young, inexperienced me. They took me to their finely furnished office, offered me a beverage, and watched me squirm in the big leather chair. You can imagine the thoughts racing through my head! Mr. Lee was a kind older man, born in Hong Kong, but raised here in the United States. Mr. McGee was an older southern gentleman. They began the conversation by complimenting me on my booth and wondering where I found my treasures. After a nice and comfortable time together, they sincerely took me under their wings and shared some invaluable insight I will never forget, that I would like to share with you. Now in my 50s, I think back to that time and realize that little meeting with them was a tremendous gift to me. A gift of guidance and affirmation. A gift of direction and how I can serve my clients. Hindsight is an incredible thing when all the pieces click together. They were right on all accounts. Much has been asked of me in the last 25 years, and I did my best to always deliver. Temptation is everywhere, but I steered far away from it. Honesty and ethics are always at the forefront. Because so few possess it, I stood out among them. Old fashioned and 19th century thinking? Perhaps, but it’s the secret to my success. From that moment to this, I never forgot what they told me. Both of them are gone now, but they left an impressionable young lady with something she could never pay for, because it was priceless. From the beginning of time, there has always been good and evil. In today’s society, we need to be extra careful of the professionals we select to help us, whether it’s handling an estate or remodeling a bathroom. Always look for someone who walks a straight line. Always listen for the good people say about them. Research these business owners who mean to serve you. Make sure they are credible, professional, and the cream of the crop. It is a question I am asked often; each time I have to smile to myself, knowing the course of events that transpired to get me into the estate business and evolve with it. Allow me to preface this by saying I don’t think I chose “it”. I think “it” chose me. Wilma was 103 years old. While I had dabbled in the buying and selling of antiques back then (25 years ago), she had heard about me and invited me over for advice on what to do with her beautiful European residential contents upon her death. She said she was “ready for the hole” which I found amazingly blunt, but she was honest and genuinely worried about her things, as to not be a burden to anyone once she was gone. She had outlived her husband and children. We agreed I would return in a couple of weeks to discuss options, etc. Upon my return, her beautiful home looked like a carnival had just trampled through it. You can imagine my horror when it was clear to see that her neighbors and so-called friends came over and helped themselves, breaking fine rare German figurines in the process and leaving debris behind for her to clean up. They had purchased her sterling, antique furniture, antique clocks, etc. from her for a dollar, $5, a few bucks here and there, and her possessions were worth a small fortune … tens of thousands at that time. It was, for me, a moment of truth – an epiphany, if you will – about the inner workings of human nature. Truly, I was disgusted by what I saw, and felt both a deep sorrow for her, as well as a disdain for the people who had done this to her. How could they do that? We’re supposed to protect those who can’t protect themselves. From my best recollection, I lifted a silent prayer thinking about all the Wilma’s out there that needed advocates, to protect them from these unscrupulous people who knew her for decades and still totally took advantage of her, with little regard for their actions. It was unconscionable. She asked me if she had been taken advantage of, and I looked her straight in the eyes and said, “Yes. I am afraid so.” She nodded, knowing what had really happened and thanked me for my honesty. What she said next was what led me to this industry and to my life’s calling. “We old folks really need an estate lady like you!” And right there, sitting on her remaining green velvet antique sofa, the light bulb went off and I received my life’s instructions. “The Estate Lady” was born. I quit a cushy pharmaceutical job and went to work for myself, figuring if I was working this hard for them, I might as well work this hard for myself. It was a tremendous leap of faith. From that moment to this, there have been many, many obstacles, plenty of tears for what I see in the industry (both good and bad), lots of sweat equity and even blood spilled due to its physical demands. My back is riddled with arthritis and my once beautiful hands show the signs of hard work. BUT … I’ve never once looked back. I’ve never regretted a thing. I am not rich, but in so many ways I am, because my clients allowed me into their lives. They shared their secrets and pain, and somehow, no matter how small or large, my compassion, skills, and presence made a difference in their lives. That is what allows me sleep like a baby every night, knowing I have served so many to the best of my ability. It is the driving force of my spirit. If you know someone interested in pursuing this industry, share this link with them: http://www.aselonline.com/index.html. They can expect lots of hard work with little glamour. But if they are looking for a career in an industry that serves so many, and are willing to work hard and earn a decent income, it becomes a win-win. Not everyone is cut out to do this kind of work. It takes the kindness and compassion of a minister, combined with the grit of John Wayne. If this sounds like you, I would encourage you to explore it. I cannot imagine doing anything else with my life!